Throughout the Egyptian town of Eastern Bani Ahmed south of Cairo, the Christian-owned shops are closed. 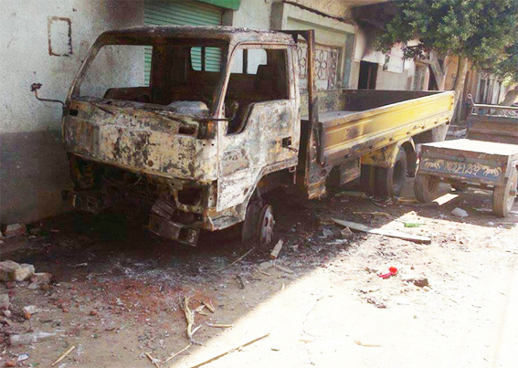 At least seven Christian homes, and even more of their vehicles, have been ransacked, burned, or both. At least 18 people are injured, and police have issued dozens of arrest warrants. A disagreement over a song on the radio was all it took to set off the violence Aug. 3. Since July 3, when the Egyptian military removed the Muslim Brotherhood from power, anti-Christian backlash has flared in pockets across Egypt. Though there have been many examples of Christians and Muslims breaking bread together and joining ranks to support moving the government off the Brotherhood’s Islamist path, the crescendo of violence has heightened Christian anxiety. It has proven worrisome enough that Coptic Pope Tawadros II last week backed out of public appearances he had planned for this week at St. Mark’s Cathedral in Cairo. He determined his presence could endanger the congregation, according to Bishop Angaelos, leader of the Coptic church in the United Kingdom, who revealed the pope’s change of plans to the BBC. Two days after the July 3 government takeover by the Egyptian military, four Christian men were killed during daylong assaults on Christians in al-Dabayia, a town west of Luxor in southern Egypt. On July 6, gunmen shot and killed a Coptic priest, Mina Abboud Sharubim, in northern Sinai. Five days later in Sheikh Zuweid, a remote settlement a few kilometres west of the Israeli border, the decapitated body of Magdy Lamei Habib, a Christian electronics merchant, was discovered. Over the radio in the cafe could be heard the song “Teslem Elayady,” a catchy pop tune that praises the Egyptian military. Radi moved to turn the music off. A customer, a Christian man named Hanna Dos Fahmi, asked Radi to keep the radio tuned to the song. The argument began. Cooler heads stepped in and broke up the argument. After the iftar, however, a group of Muslim men appeared at the cafe. A group of Christians showed up in opposition. The confrontation escalated quickly as Muslims from neighbouring villages arrived in Bani Ahmed, chanting slogans against Copts, police and the military. Some carried guns and Molotov cocktails. The crowd grew to about 4,000 people. A pharmacy, furniture store, auto-repair shop and other Christian-owned businesses were looted, according to the diocese statement. Several homes were set on fire. Clashes broke out in surrounding villages. Security forces did not arrive in force until 11:30 p.m., and used tear gas to disperse the rioters. The Associated Press reported that 18 people were injured, and that police issued arrest warrants for at least 35 people. The diocese said the riots caused damage estimated at nearly 3.4 million Egyptian pounds, or about US $480,000. On Sunday morning, Aug. 4, a group of Muslims barricaded the entrance to the Coptic Church in Bani Ahmed, preventing members from attending mass. A Christian teacher in Bani Ahmed told World Watch Monitor that a tense calm has settled over the town during the days since the Aug. 3 disturbance. Security forces are visible in the town. On Aug. 9, the teacher said, Muslims burned an abandoned Muslim home in an attempt to accuse Christians of the act, but security officers moved in before the gathering crowd could lash out. In the meantime, the teacher said, shops and the church remain closed. World Watch Monitor is withholding his name to ensure his safety. On Aug. 6, about 100 kilometres south of Bani Ahmed, thousands of Islamists marched through the streets of Assiut, chanting “Islamic, Islamic, despite the Christians.” Christians shuttered their shops and retreated to the interiors of their darkened homes. News service Ahram Online reported Aug. 7 that Egypt’s prosecutor-general had ordered 11 people held in custody for 15 days while authorities investigated the Bani Ahmed violence.